In case you thought that Samsung is done updating the original Galaxy S lineup, you were wrong. A yet to be announced Samsung Galaxy S Advance has emerged in photos and a YouTube video, thus bringing yet another member to the device family, which the I9000 Galaxy S started two years ago. The upcoming smartphone, which carries the GT-I9070 moniker sports a dual-core CPU, clocked at 1GHz - a first for a Galaxy S phone. Its design has been refreshed as well - the device sports a slightly curved screen and a 3.5mm audio jack at its bottom, a la Samsung Galaxy Nexus. The rest of the known specs are practically unchanged from those of the I9000. 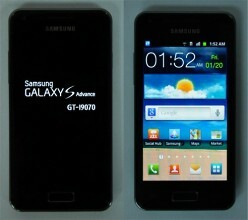 The screen is a 4" Super AMOLED with WVGA resolution. A 5MP camera, capable of recording 720p videos can be found on the back. The battery is with capacity of 1500 mAh. 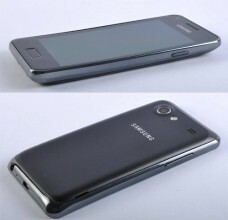 The Galaxy S Advance will sport Android 2.3.6 Gingerbread when released. Given the dual-core CPU on board though, an Ice Cream Sandwich update is more than likely. You can see a video of the handset in action below. Expect to see the new member of the Galaxy S family get unveiled at MWC in Barcelona next month. We will be on the spot, so expect the full scoop on the smartphone as soon as we get it. mostly all phones have only digital zoom that means if you take picture without zoom you can zoom it later.